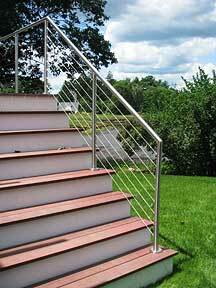 Stainless steel railings are now the most popular line of railings offered by G&E Steel. Their simple elegance and clean, streamlined look have endeared them to architects, homeowners and builders throughout New England. Over the past few years, G&E Steel has been asked to install many different styles of stainless steel railings in settings ranging from the lobbies of prestigious companies to the foyers of the most opulent homes in the area. Stainless steel has exploded in popularity as a building material and it is now being used for high end appliances, columns, mirror frames, fire place surrounds, various trim pieces and, of course, railings. Whether your home costs $500,000 or $5 million, stainless steel railings are the perfect accent to complement any contemporary décor. Please take a minute to view some of the beautiful pieces fabricated and installed by G&E Steel, the premier fabricator of custom made, stainless steel railings in New England. While making your decision, please keep in mind that if you hire G&E Steel your are not buying a box of parts or paying a middleman to broker a deal with an out of state company that will take several months and many headaches to complete. When you hire G&E Steel, you are hiring a highly experienced team of dedicated professionals that will treat your project as if it were our own. All our railings are fabricated and installed by G&E Steel employees utilizing measurements taken in the field to insure the accuracy of our work. All welding is performed by certified welders and the polishing process has been designed to eliminate imperfections. Exterior railings are always fabricated with grade 316 stainless steel in order to protect against corrosion. At G&E Steel, customer satisfaction is our number one priority. We take great care to adhere to a project’s specifications and production schedule and we will work closely with your architect or builder throughout the building process. 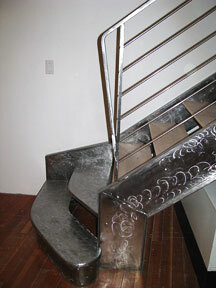 CAD drawings and sample railings may also be provided for approval prior to fabrication. Finally, do not hesitate to visit our 2,000 square foot showroom conveniently located near downtown Salem to see some of our work in person. The “Alyssandra” style of railings is made with highly polished (#7 mirror finish), 1.66” round stainless steel pipe for the handrail and all posts. Posts can be side mounted to stair stringers and/or balconies or they can be floor mounted to finished floors or to subfloors. Floor mounted posts are secured with welded base plates and special flange covers that hide all lag bolts from view. The railings feature ½” tempered clear glass panels with polished edges mounted with specially designed stainless steel glass clamps. The “Alessandra” style is available for residential applications where 36” of height are required and for commercial applications requiring railings measuring 42” in height with an offset handrail set at 34” in height. The “Arianna” style of railings is made with polished (#4 brushed finish), 1.66” round stainless steel pipe for the handrail and all posts. Posts can be side mounted to stair stringers and/or balconies or they can be floor mounted to finished floors or to subfloors. Floor mounted posts are secured with welded base plates with special flange covers that hide all required lag bolts from view. The railings feature ½” tempered clear glass panels with polished edges mounted with specially designed stainless steel glass clamps. The “Arianna” style is available for residential applications where 36” of height are required and for commercial applications requiring railings measuring 42” in height with an offset handrail set at 34” in height. 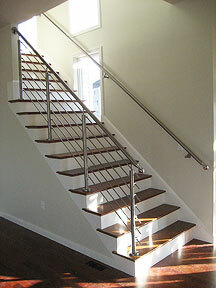 The “Emma” style of railings is made with polished (#4 brushed finish), 1.66” round stainless steel pipe for all posts. Posts can be side mounted to stair stringers and/or balconies or they can be floor mounted to finished floors or to subfloors. Floor mounted posts are secured with welded base plates and special flange covers that hide all required lag bolts from view. The handrails are a combination of round 1.66” beech wood with 1.66” round stainless steel connectors, handrail brackets and end caps. 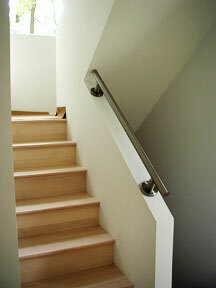 Wooden handrails are available with the following finishes: beech, natural, wengé, and unfinished. The railings feature ½” tempered clear glass panels with polished edges mounted with specially designed stainless steel glass clamps. The “Emma” style is available for residential applications where 36” of height are required and for commercial applications requiring railings measuring 42” in height with an offset handrail set at 34” in height. The “Isabella” style of railings is made with polished (#4 brushed finish), 1.66” round stainless steel pipe for the handrail and all posts. Posts can be side mounted to stair stringers and/or balconies or they can be floor mounted to finished floors or to subfloors. Floor mounted posts are secured with welded base plates and special flange covers that hide all required lag bolts from view. The railings feature 3/8” round stainless steel bars attached to each posts horizontally with special bar mounts. For residential applications requiring railings measuring 36” in height, seven lines of 3/8” bars are recommended to maintain a maximum spacing of 4” between bars. For commercial applications requiring railings measuring 42” in height, nine lines of 3/8” bars are recommended to maintain a maximum spacing of 4” between bars. Railings measuring 42” in height will also feature an offset handrail made with polished 1.66” round stainless steel pipe set at 34” in height. The “Natasha” style of railings is made with 2” wide x ¾” thick brushed steel flat bar for the top rail and 1½” wide x ¾” thick brushed steel flat bar for the posts (all brushed steel is painted with a clear lacquer finish prior to installation). Posts can be side mounted to stair stringers and/or balconies or they can be floor mounted to finished floors or to subfloors with welded base plates. 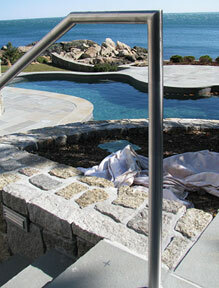 The railings feature 3/8” round stainless steel bars welded to each post horizontally. For residential applications requiring railings measuring 36” in height, seven lines of 3/8” bars are recommended to maintain a maximum spacing of 4” between bars. For commercial applications requiring railings measuring 42” in height, nine lines of 3/8” bars are recommended to maintain a maximum spacing of 4” between bars. Railings measuring 42” in height will also feature an offset handrail made with polished 1.66” round stainless steel pipe set at 34” in height. The “Francesca” style of railings is made with polished (#4 brushed finish), 1.66” round stainless steel pipe for the handrail and all posts. Posts can be side mounted to stair stringers and/or balconies or they can be floor mounted to finished floors or to subfloors. Floor mounted posts are secured with welded base plates and special flange covers that hide all required lag bolts from view. The railings feature 1/8” or 3/16” round stainless steel cable which pass through intermediate posts and are secured to end posts with specially designed stainless steel hardware. For residential applications requiring railings measuring 36” in height, seven lines of 1/8” cable are recommended to maintain a maximum spacing of 4” between bars. For commercial applications requiring railings measuring 42” in height, nine lines of 1/8” or 3/16” cable are recommended to maintain a maximum spacing of 4” between bars. Railings measuring 42” in height will also feature an offset handrail made with polished 1.66” round stainless steel pipe set at 34” in height. Please note: to prevent the stainless steel cable from sagging, posts must be located at a maximum of 4’ feet apart. The “Carolina” style stair of railings is made with polished (#4 brushed finish), 1.66” round stainless steel pipe for the handrail and all posts. The posts are secured with welded base plates and special flange covers that hide all required lag bolts from view. The posts may also be inserted into holes core-drilled into concrete or granite and fastened with non-shrink hydraulic cement. The “Carolina” style is available for residential or commercial applications where a stair railing measuring 34”-36” of height is appropriate. The “Giulia” style of railings is an excellent handrail that can be added to the top of half walls built to serve as guardrails or stair railings. 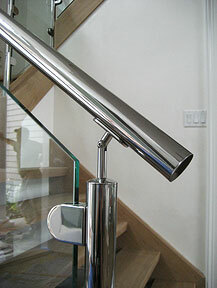 The hand rail and hand rail brackets are made with polished (#4 brushed finish), 1.66” round stainless steel pipe. 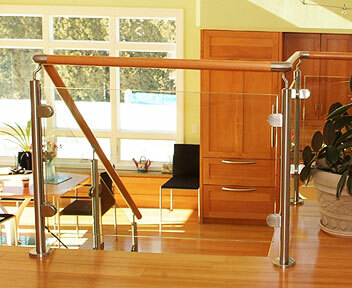 G&E is an expert fabricator of railings for both residential and commercial projects. 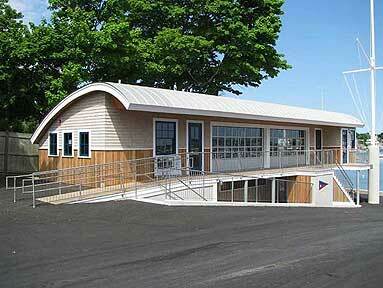 The "Antonietta" style of railings shown here were fabricated and installed for the Pleon Yacht Club of Marblehead, MA. The railings were made with polished (#4 brushed finish), 1.66" round stainless steel pipe for the handrail and all posts. The posts were secured with welded base plates with special flange covers that hid all the required lag bolts from view. 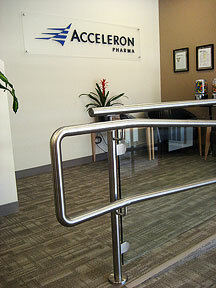 The railings also featured 3/8" round stainless steel pickets mounted vertically. All railing connections were welded and expertly polished to produce a smooth seamless product. As you will see when viewing the following images, the railings were custom made to satisfy the building code requirements for all existing conditions. G & E Steel Fabricators, Inc.
© Copyright 2002-2009 G & E Steel Fabricators, Inc, All Rights Reserved.